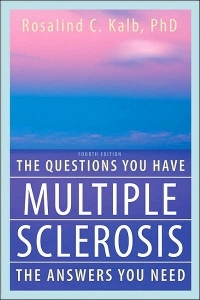 All the questions you have about MS - just about anything you can think of - will probably be answered in this book by Dr. Rosalind Kalb. This is one of the first books I read when Cir was first diagnosed with MS. It was one the most helpful books I have ever found so far. I was really happy when Caresource (the company that makes Copaxone) sent him a copy one year. Unfortunately, they don't send them out anymore. If you would like to listen to this page, play the video to the left and follow along. We totally recommend this book for anyone new to MS. The answers are written in a straightforward, easy to read style. You can easily look through the contents to find exactly what you are looking for. You might feel overwhelmed at first because the book is very thick. The last update, the fourth edition, is a whopping 604 pages long. Don't be discouraged, though. The book is designed in such a way that you can easily find the things that you need. It is divided into four parts. Each is a collection of articles by specialists in their field. From what is MS, to how it's treated, to helping you and your family cope with the disease, and finally to financial and life planning strategies, this book is a must read. "more information than you may ever need to know about MS". I like the fact that she includes every (or most of them anyway) question you will ever have in the course of your disease. Check it out for yourself. The first chapter shows you how to make the best use of the book. There are helpful hints on how to find what you need. And information on where to find more information on each of the subjects included in the book. We're sure you'll be equally impressed with the way your questions are answered. If you can't purchase it right away, check it out at your local library. Most libraries will send you a copy in the mail with return postage as a courtesy to their disabled customers, if that is the case with you. That way you can preview it for yourself before actually making an investment. Believe me, though, you will probably refer to it over and over, and will soon want your own copy. Cir and I have one. We've recommended it many times over the years to people who have found it very helpful. I'm certain you will, too. A Kindle version - Rent or Buy - yes! And if you have trouble reading the tiny font, or even holding the book, there's always the Kindle ebook version (link opens a new window). Well, of course it doesn't have to be a Kindle. Any ebook reader or device is the perfect tool to read this gem of a resource. You'll be able to bookmark it, add notes, adjust the font, or have it read out loud to you. Perfecto! Want to take a peak inside the latest edition? Click here - - to check it out! And to see more of Rosalind Kalb's books, click here - Rosalind Kalb at Barnes & Noble - (Clicking link will open a new window).